You can access File Management from the Settings > File Management menu. Files you upload via hosting can be used in other areas of Bronto, like in messages. All files hosted in the application are stored on Akamai. 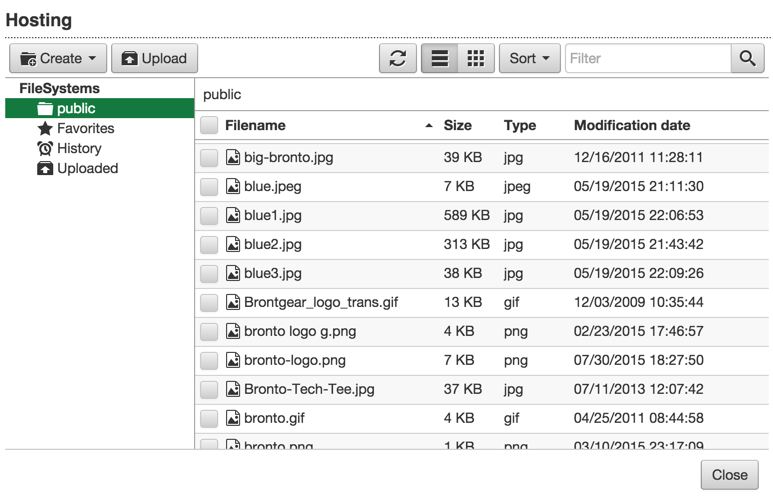 You can upload files to be hosted on Bronto. Once you start building messages, it is easy to accumulate a lot of files. Here are best practices for organizing your files and optimizing images. You can create folders that can be used to organize your hosted files. You can perform basic image editing on your hosted images right in Bronto. You can move hosted files between folders. You can preview hosted files. Filtering and sorting allows you to locate hosted files contained in a particular folder. You can rename your hosted files and folders. You can download hosted files and folders. You can add hosted files and folders to your favorites folder. You can delete hosted files and folders. If you have hosted files you want to keep but don't really use you can add them to a zip folder to save space.